A majority of Americans believe that climate change is happening now, caused mainly by human activities, including 55 percent of New Hampshire residents and 52 percent nationwide. The findings come from a new Issue Brief - Do You Believe the Climate Is Changing? 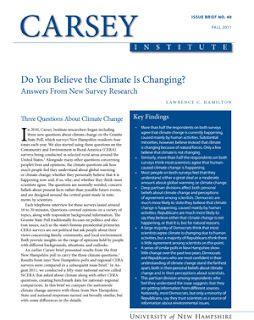 Answers From New Survey Research - published by the Carsey Institute at the University of New Hampshire on December 6, 2011. A substantial minority – 35 percent in New Hampshire and 39 percent nationally - believe that climate change is happening, but caused mainly by natural forces. A tiny minority – 3 percent in New Hampshire and 7 percent nationally – believe climate change is not happening now. While a number of the 2012 Republican presidential candidates dispute the idea that climate change is caused by human activity, at least one of those skeptics may be open to climate preparedness or adaptation strategies. "It may be that it is dramatically less expensive to adjust to a change in climate than it is to stop the entire planet from changing," Newt Gingrich told voters gathered at a Granite State PAC house party in Manchester, NH back in May. And also don't forget moose are rutting all year long now, the cows are farting more than usual, birch bark just doesn't burn as good as it used to and ol' Fred down the street got stung twice this honey harvesting season.